In 2016, I was fortunate enough to cross the Simpson Desert with a friend from work. Depending on the weather conditions and the condition of the track and what not, this journey can be fairly demanding on the vehicle. I thought it was a wise idea to prepare the Discovery for the trip. As well as making sure everything is as mechanically sound as possible, I also performed the following tasks in order to reduce the chances of a breakdown in a very remote area. I replaced all the cooling system hoses with new ones from a reputable manufacturer. Changed all the differential, gearbox, transfer case and engine oil. Replaced the suspension springs and shock absorber together with the steering damper. 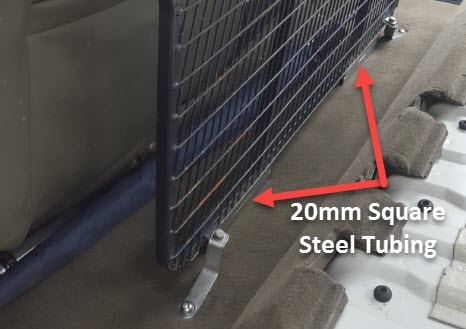 This page shows how I also fitted a second cargo barrier behind the front seats to create a cargo cell to better carry the load needed for this trip. I read on various expedition sites that having a second cargo cell is the way to go. It helps to segregate the load as well as adds to load security when travelling on rough tracks. 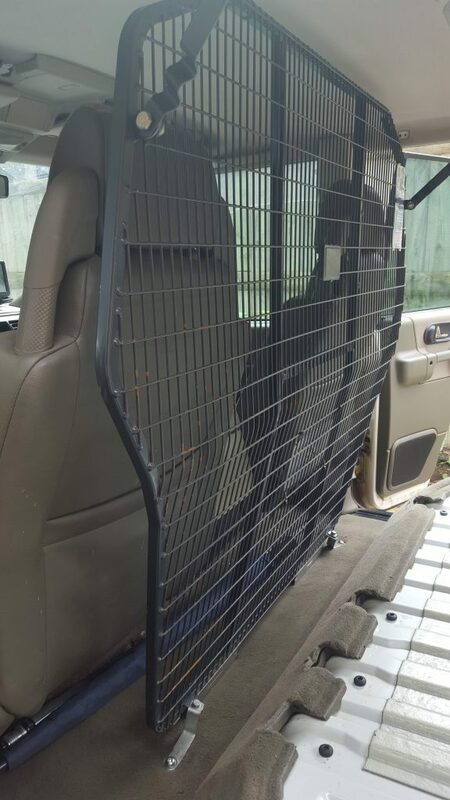 As I managed to get a Milford Cargo Barrier for a very cheap price, I decided to add one. 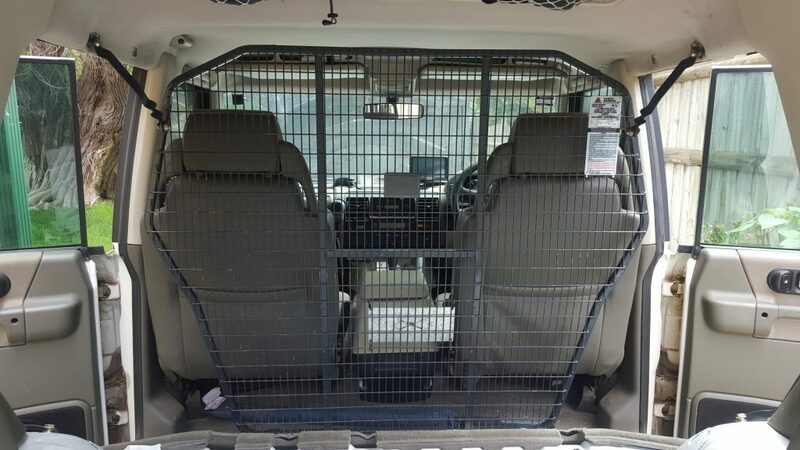 I have Milford cargo barriers in a number of Land Rovers and I am very pleased with the quality of their products. Here is how I prepared and fitted the second barrier. The cargo barrier that I managed to get hold of was in really good condition. The only thing that I had to do was to weld two 100mm lengths of 20mm square steel tube to the bottom of it to give a slight offset from the floor. Once this was done the barrier was painted with black No Rust spray paint to help protect the bared metal. The rear seats were removed. I was surprised with just how much these weigh. 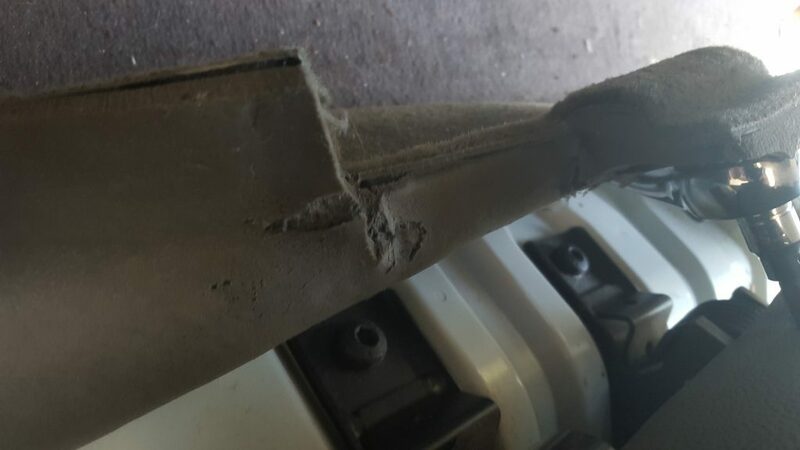 They are removed by removing several Torx screws from the front under side of the seats. They are then released by using the handle that folds them flat. 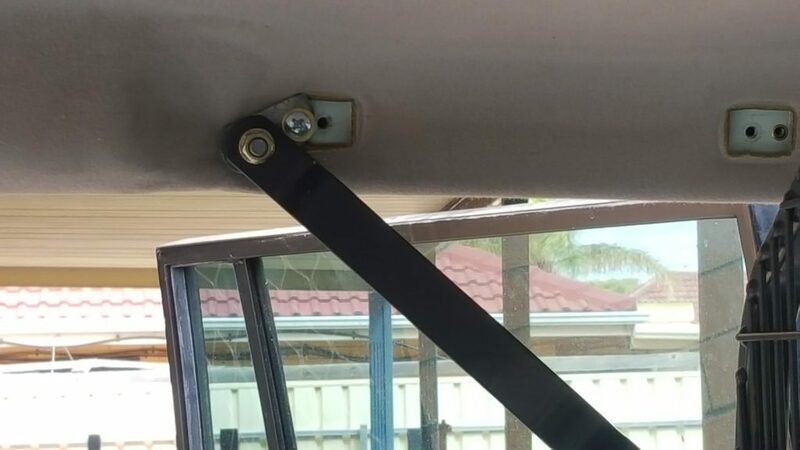 Measurements were taken and the top of the barrier was attached to the car using the threaded hole that was accessed once the rear grab handles were removed from above the rear door. To give a little flexibility, a small piece of 3 x 20mm steel flat bar was used to secure the barriers mounting bracket to the threaded hole. This allowed for a small amount of movement when aligning up the various holes used to mount the barrier. To secure the bottom of the cargo barrier, I made two plates with three holes drilled into it along the plates centre line. All these holes were then threaded. After measuring where the plates needed to go, corresponding holes were then drilled through the floor of the car to match the ones in the plate. Care was taken in this process to ensure nothing important was drilled into on the car’s underside, brake pipes, fuel lines etc. When all the holes were drilled and deburred, the two outer ones were used to fix the plate to the car using dome headed bolts. 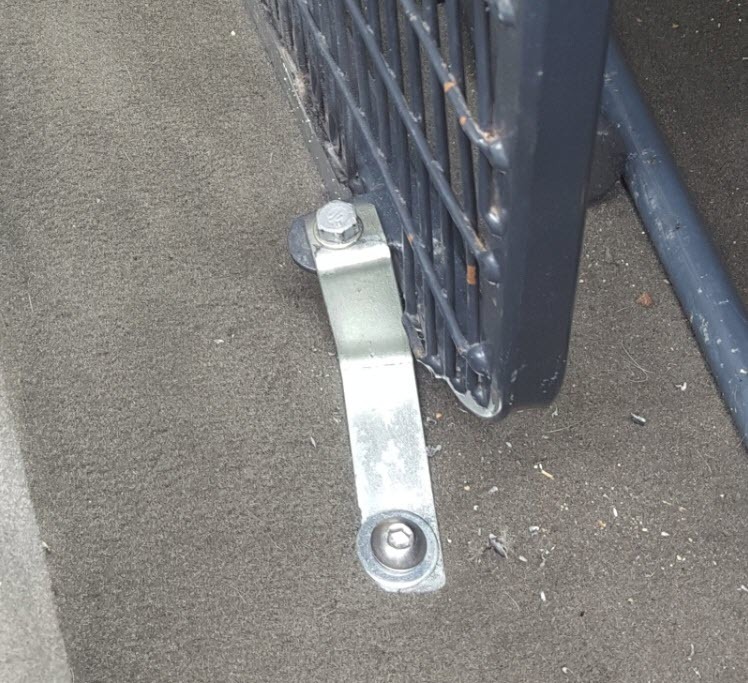 The center hole was used to fix the bottom of the cargo barrier to the car using a fabricated bracket made from 25mm flatbar. This can be seen in the picture to the left. 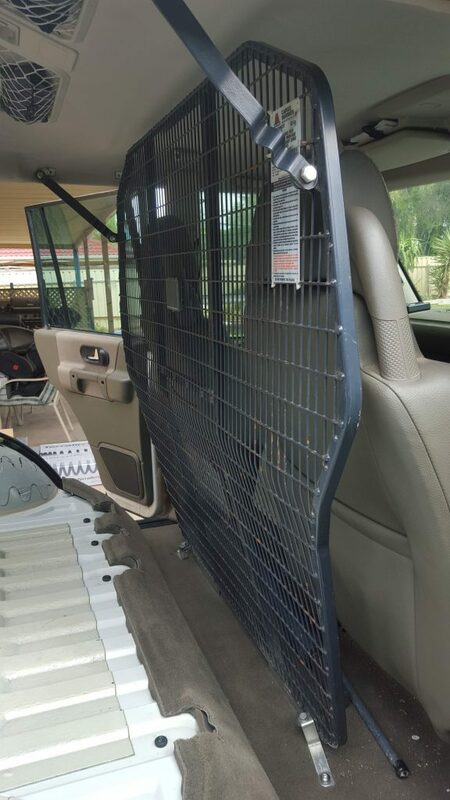 Once all the brackets were tightened up the cargo barrier felt very secure. I made a plywood floor for the space between the two cargo barriers and used this to mount a bracket I made that held three 20ltr jerry cans to hold the extra fuel needed for the desert trip. The plywood floor was secured by using brackets on both the front and rear cargo barriers. This also provided some extra bracing for the front barrier. The extra storage space provided by this modification was significant. 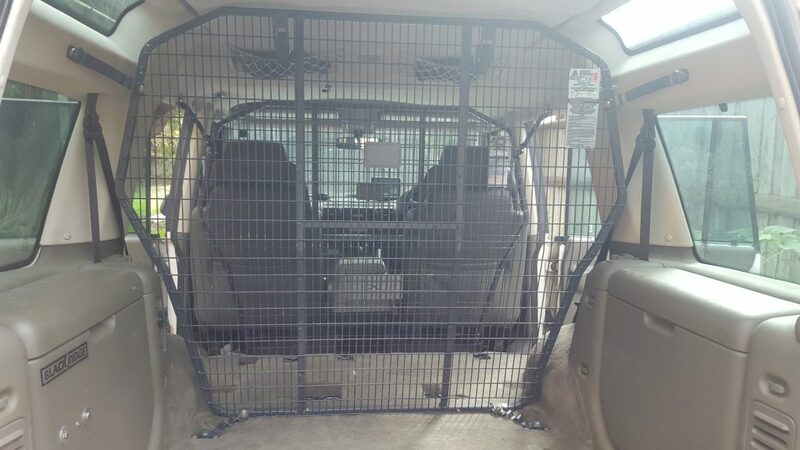 Much more than using the extension bars available for the Milford Cargo Barriers. It also gave some piece of mind on some of the rougher tracks that nothing was coming from the back of the car to pay you an unwelcome visit. Below are some pictures of the finished setup. Sadly I did not take any photos of the floor I made so you’ll just have to use your imagination for this part. It did look fantastic though. Once the plywood floor was fitted I made a simple bracket from two pieces of 3mm steel plate that was fastened to the mesh of the front cargo barrier. This was used to fix the second spare wheel securely in place. Again, no pictures of this but it was very simple bracket made from two plates and a long bolt securing them both together passing through the hub hole of the wheel.